[S1854] Ann Kurth, "Email from Ann Kurth on 06 Jan 2008," e-mail message from e-mail address (n/a) to Steven Harn Redman, 06 Jan 2008. Hereinafter cited as "Email from Ann Kurth on 06 Jan 2008." [S1855] Ann Kurth, "Email from Ann Kurth on 02 Jan 2008," e-mail message from e-mail address (n/a) to Steven Harn Redman, 02 Jan 2008. Hereinafter cited as "Email from Ann Kurth on 02 Jan 2008." [S1856] Obituary of Reason E. Harn, online www.ancestry.com, (located on family tree on ancestry.on, submitted by carolyn donithan). Hereinafter cited as Obituary of Reason E. Harn. [S1873] Martha Jane McNeil gravestone; n/a, n/a, Birth: Feb. 22, 1861 Death: Feb. 11, 1936. [S1873] Martha Jane McNeil gravestone. Description:. Hereinafter cited as 1900 Federal Census - Illinois. Ancestry.com. Texas Birth Index, 1903-1997 (database on-line). Provo, UT, USA: The Generations Network, Inc., 2005. Original data: Texas. Texas Birth Index, 1903-1997. Texas: Texas Department of State Health Services. Microfiche.
. Hereinafter cited as Texas Birth Index, 1903-1997. Ancestry.com. Texas Death Index, 1903-2000 database on-line. Provo, UT, USA: Ancestry.com Operations Inc, 2006. Original data: Texas Department of Health. Texas Death Indexes, 1903-2000. Austin, TX, USA: Texas Department of Health, State Vital Statistics Unit.. Hereinafter cited as Texas Death Index, 1903-2000. Ancestry.com. Texas Birth Index, 1903-1997 (database on-line0. Provo, UT, USA: The Generations Network, Inc., 2005. Original data: Texas. Texas Birth Index, 1903-1997. Texas: Texas Department of State Health Services. Microfiche. Ancestry.com. Texas Birth Index, 1903-1997 (database on-line). Provo, UT, USA: The Generations Network, Inc., 2005. Original data: Texas. Texas Birth Index, 1903-1997. Texas: Texas Department of State Health Services. Microfiche.. Hereinafter cited as Texas Birth Index, 1903-1997. Joslyn Roseanne Reber married James Merrill Sorensen, son of Mark Wayne Sorensen and Sherrill Ann Sanders, on 22 March 2008 at Salt Lake LDS Temple, Salt Lake City, Salt Lake Co., Utah. [S1864] Keri (Stocco) Heroux, "Email from Keri Heroux 14May2008," e-mail message from e-mail address (n/a) to Steven Harn Redman, 14 May 2008. Hereinafter cited as "Email from Keri Heroux 14May2008." [S1991] Minnesota Marriage Collection, 1958-2001, online http://ancestry.com. Hereinafter cited as Minnesota Marriage Collection, 1958-2001. Male Kotchman married Mildred Louise Harn, daughter of Paul Duff Harn and Mildred Virginia Bauch. State Journal-Register, Springfield, IL, October 13, 1990. BEARDSTOWN - Anna Harn, 85, of Beardstown, formerly of Rushville, died at 2:25 a.m. Sunday, July 18, 1993, at St. Luke Health Care Center. Born Dec. 26, 1907, near Marietta to William P. and Mary E. Smith Ackerson, she married Onzelo G. Harn Dec. 23, 1926, in Lewistown. He died Oct. 11, 1990. One grandson, one granddaughter, three great-grandchildren, one brother and two sisters also preceded her in death. Surviving are two daughters, Doris Baker of Rushville and Violet Lashbrook of Beardstown; one son, Donald of Oklahoma City, Okla; 13 grandchildren; 32 great-grandchildren; four brothers, Perry Ackerson and Clarence Ackerson, both of Bushnell, Glen Ackerson of Pekin, and William Ackerson of Marietta; and three sisters, Florence Bollinger of Mesa, Ariz., Charlotte Krusan of Canton, and Pearl Pendl of Bellevue. She had worked at the Cudahy Packing Company and Mickleberry Packing Company in Rushville for many years. Graveside services will be 2 p.m. Wednesday at Palm Cemetery, Rushville, with the Rev. Michael Cooper officiating. Visitation will be 7 to 9 tonight at Worthington Funeral Home, Rushville. RUSHVILLE - Anna Harn, 85, of Beardstown, formerly of Rushville, died at 2:25 a.m. Sunday at the St. Luke Health Care Center in Beardstown. Graveside services will be held at 2 p.m. Wednesday at Palm Cemetery near Rushville. Worthington Funeral Home, Rushville, is in charge of arrangements. [S1868] Carolyn Donithan, "Email from Carolyn Donithan 03Mar2008," e-mail message from e-mail address (n/a) to Steven Harn Redman, 03 Mar 2008. Hereinafter cited as "Email from Carolyn Donithan 03Mar2008." State Journal-Register, Springfield, IL, July 20, 1993, Page: 16. [S1869] Donna Harn Norton, "Email from Donna Harn Norton 09Mar2008," e-mail message from e-mail address (n/a) to Steven Harn Redman, 09 Mar 2008. Hereinafter cited as "Email from Donna Harn Norton 09Mar2008." RUSHVILLE - Doris I. Baker, 81, of Rushville passed away at 8:30 p.m. Saturday, April 7, 2012, at Culbertson Memorial Hospital in Rushville. She was born on July 16, 1930, in Schuyler County, Ill., the daughter of the late Onzelo G. and Anna B. (Ackerson) Harn. She first married Edward Hollis. She later married Dale Hammack. She married Thomas E. "Tom" Baker on Aug. 2, 1982, in Rushville. He preceded her in death on July 27, 2010. 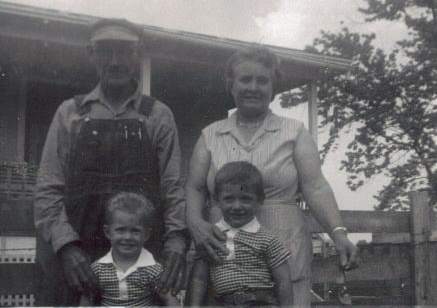 Surviving are three sons, Marvin Hammack (Sue Ann) of Bader, David Hammack (Juanita) of Astoria and Raymond Hammack (Tracey) of Summum; daughter-in-law, Debbie Hollis France of Beardstown; special friends, Glenn and Rita Wilcoxen of Vermont; 17 grandchildren; nine great-grandchildren; one brother, Donald Harn of Tulsa, Okla; and several nieces and nephews. She was preceded in death by a son, Timothy W. Hollis; three grandchildren; and one sister, Violet Lashbrook. Doris first worked at Astoria Fiber Steel and worked on the family farm. Later, she worked at Ken-Ray Foundry in Vermont. For many years, she cleaned houses locally. She attended the Vermont Christian Church. Services will be at 10 a.m. Thursday, April 12, 2012, at the Wood Funeral Home in Rushville, with the Rev. Dave Vandeman officiating. Interment will follow in the Palm Cemetery. Visitation will be from 5 to 7 p.m. Wednesday at the Wood Funeral Home. Memorials are suggested to Palm Cemetery or the Culbertson Memorial Hospital Foundation. You are invited to share your memories of Doris and leave condolences at www.woodfh.net. [S2052] Doris Baker Obituary, Peoria Journal Star, http://www.legacy.com/obituaries/pjstar/obituary.aspx?page=lifestory&pid=156922752#fbLoggedOut, 10 Apr 2012. Hereinafter cited as Peoria Journal Star. [S2053] Letter from Jennifer (Hammack) White (P.O. Box 205;Bluffs, IL 62621) to Steven Harn Redman, 27 May 2012; Steven Harn Redman (2633 N. 1600 E., Layton, Davis Co., UT). [S2054] Findagrave obituary entry for Thomas E. Baker, online http://www.findagrave.com/cgi-bin/fg.cgi?page=gr&GSln=baker&GSfn=thomas&GSmn=e&GSby=1929&GSbyrel=in&GSdy=2010&GSdyrel=in&GSob=n&GRid=55903465&df=all&. Hereinafter cited as Thomas E. "Tom" Baker. Violet Mae Harn was born on 11 October 1927 at Illinois; she was 2 years old in the 1930 Census. She was the daughter of Onzelo G. Harn and Anna Bell Ackerson.1 Violet Mae Harn married Richard Carl Lashbrook.1 Violet Mae Harn died on 31 January 2010 at age 82; death notice published in Peoria Journal Star on February 1, 2010. Her married name was Lashbrook.1 She lived in 1990 at Beardstown, Cass Co., Illinois.1 She lived in 1993 at Lashbrook, Illinois; when mother died.2 Her Social Security Number was 359-20-1612 issued in Illinois, SSDI lists born 11Oct1927 and died 31Jan2010. Richard Carl Lashbrook was born on 8 February 1925 at Illinois. He married Violet Mae Harn, daughter of Onzelo G. Harn and Anna Bell Ackerson.1 Richard Carl Lashbrook died on 13 August 2012 at Beardstown, Cass Co., Illinois, at age 87. State Journal-Register, Springfield, IL, October 13, 1990. Hereinafter cited as Genealogy Trails' Schuyler County, Illinois Obituaries.